Today we are travelling to an island nation with turquoise color beaches, oh yes Mauritius it is!!! Oh, i love the beaches, i wish i can visit them someday in my life-time. Discovered by Portuguese, this beautiful island formed by some volcanic activity was once a home for rare flora and fauna. The Extinct dodo bird was a species once used to be seen like crows in mauritius. But after human habitation and due to introduction of species that were alien to that land, most of the flora and fauna now are seen only in books. Within 100 years of the arrival of humans on Mauritius, the once abundant dodo became a rare bird. Weighing around 20kgs, the bird became the fresh source of meat for sailors who set foot on this island. Sad to hear na, hmm! hope we save what is left at least!! Ok, now jumping to food, the cuisine is heavily influenced by French, Indian and Chinese. When i was looking what to cook, again got a list of Must-try Mauritian food from here. I planned to do the famous Dholl puri/Dal puri,flat-bread stuffed with split peas. But i couldn't get Split pea here and didn't want to substitute for the original ingredient. So, i went ahead and made these Beautiful buns that are as famous as there Dhall puri. Macatia Coco, buns filled with sweet coconut, were sold by marsan macatia (macatia seller) who carries them in his bike and rides around the city, shouting at top his voice. It sounded like our Keerai-kari(an)(spinach-seller). I tried them yesterday evening to go with our coffee and my dudes loved the texture and taste and needless to say, it was a hit!!! Heat milk in a saucepan, do not boil, it should just be warm. Add butter to this and stir well. I used my food processor for kneading the dough. Take both the flours, yeast, sugar, salt and milk powder in the processor bowl, pulse it twice to mix well. Now slowly add milk-butter mixture to this and start kneading a smooth dough.Once the dough is kneaded, transfer it to your kitchen counter/kneading surface and knead well to a smooth dough. Do not add extra flour while kneading, if you feel the dough is sticky, touch your hands in flour and knead the dough. Now leave it a well oiled bowl and let it rise for a 90 minutes or until it is doubled. When the dough is resting, prepare the filling by mixing desiccated coconut with sugar and water. After the dough doubles, transfer it to a well floured surface, punch it down and roll it out to a rectangle of 12*14. Divide the dough into 12 equal pieces. i just scored the dough with a knife (4 cols and 3 rows). Now take each portion of dough,keep 1-2 tbsp of filling in the center, bring the edges together and pinch it to close and roll it in your palm to form a ball/bun shape. 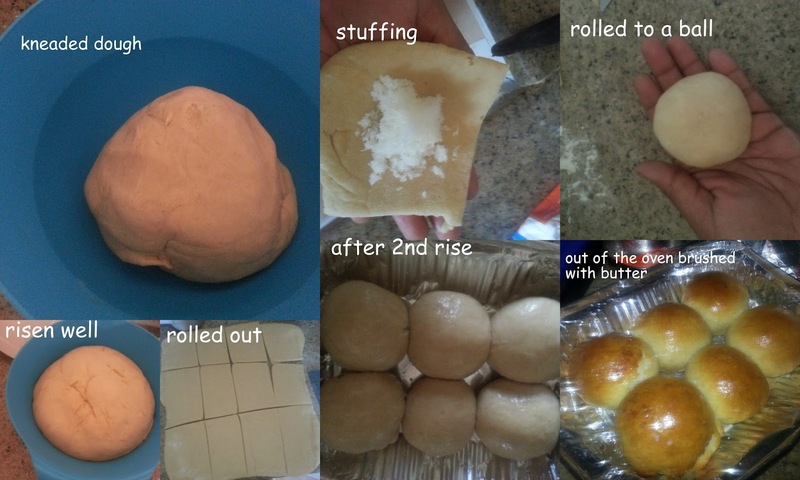 Keep the rolled dough in a greased baking pan. Repeat the same with rest of the dough. Now let the prepared buns rise for another hour until it has puffed up a bit. Preheat the oven to 180C. Brush the buns with milk-oil mix and Bake for 25 minutes or until the top is browned. Once done, remove it from oven, brush the top with melted butter and return it to the oven and bake @ 180 C for another 2 minutes. Remove it from the oven and cool it in a wire rack. Enjoy it with your evening tea or for breakast with a juice/smoothie. Some hearty buns there with yummy coconut filling. Coconut stuffed breakfast buns looks so soft and yummy! Loved the idea of this bun. They have turned out great, smooth and browned to perfection. Am in love with this coconut stuffed buns, looks prefect for me. What a soft, fluffy and pillowy buns you got there Priya. AND they are stuffed with coconut -- they must have tasted divine. Clicks are awesome. Such beautiful buns Priya..my parents lived in Mauritius for a while and they still talk about how beautiful it is there.. They look so good, Priya. The filling is too good to pass! i love coconut stuffing..and these buns look so spongy..you have done a amazing job with them..kudos! Wow Priya love the layer of coconut in it. Delicious looking bread.